Warehouse shelving is a surprisingly complex subject. How you rack and store your supplies and inventory can seem inconsequential, but there is a lurking potential for disaster. Knowing the limits of your warehouse shelving will ensure you get the most out of your business. But what are the limits of your warehouse shelving? Are your shelving solutions appropriate for your industry? If you’re unsure, you’re not alone – shelving can be easy to take for granted. Continue reading to learn more about warehouse shelving, different solutions for different shelving requirements, and the basics of shelving safety. You know your business’s shelving needs, but do you know the strengths and weaknesses of different shelving types? If not, you may not be using the right shelving solutions for your business. Longspan shelving is among the most versatile of heavy-duty shelving options thanks to its easily customisable layout design. Sloted holes in the steel posts support pins at either end of each shelving beam. Gravity holds the setup in place, but the shelves can be adjusted as needed without any specialty tools or additional manpower. Longspan shelving is a savvy choice for warehouses with fluctuating inventory needs, or for warehouses with forecasted growth that may need to rearrange shelving in the near future. Coolrooms and medical storage calls for unique storage requirements. Construction needs to be able to handle damp or wet environments, and in some cases is required to be rust free. Steel Medical Shelving is available in a number of finishes, including powder coated, zinc plated, powder coat over zinc plated and stainless steel. Plastic Hygiene Shelving is a IFHS compliant shelving with a polypropylene construction. Uprights and rails have a steel core for strength with a plastic shell encasing the steel for a rust free finish. Shelf panels are also dishwasher safe to help comply with strict New Zealand food hygiene regulations. Pallet racks are built to support shipping pallets. Pallet racks offer high load capacities, owing to the high bulk weight of pallet freight, and are designed to allow forklifts easy access. 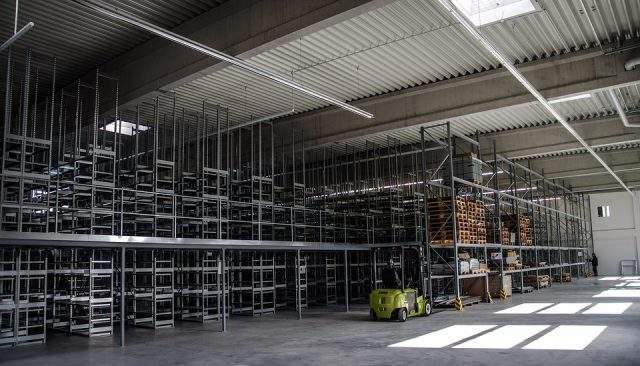 Pallet racks are more frequently floor mounted than other shelving solutions, due to their frequent contact with heavy machinery, but shelving and forklift accessories and can assist in reducing shelving collisions and minimising racking incidents. The most important thing to do when a racking incident occurs is to report it. Logging and investigating shelving failures are key to preventing them in the future. After the Canterbury earthquakes in 2010 and 2011, Worksafe New Zealand has adopted a set of shelving regulations put in place to ensure that your warehouse shelving apparatus can withstand the strain of an earthquake. Don’t assume that your stock should not be secured just because it is stationary. Shelving restraints are helpful in mitigating the fallout of a shelving collapse, but also prevent items for breaking under strain or impact with a forklift. Make sure your pallets are thoroughly wrapped, hazardous materials are secure, and heavier items are stored on lower levels. Your shelving needs are unique – so companies manufacturing lifting equipment NZ wide should be able and willing to accommodate your specific individual needs. Contact Dexters Warehouse Equipment today to find the shelving solutions that work for you.